This SOLID BOULDER Opal is from the Queensland mining fields in <?xml:namespace prefix = st1 ns = "urn:schemas-microsoft-com:office:smarttags" />Australia. 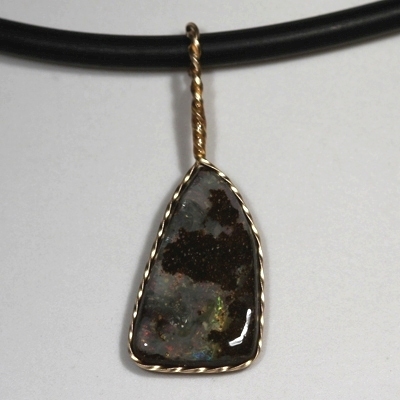 A freeform pendant using gold filled twisted wire wrapped around a solid boulder opal. A unique mix of sparkling bright gem opal and mother stone.